Twelve-string guitars guitar gives a rich and full-bodied sound. In this playing technique is a little different from that used on a conventional shestistrunniki. To configure dvenadtsatistrunnye by ear – it is quite real, but long and requires some skill. If you are just beginning to learn to play this instrument use a tuner. Many guitarists love the program GuitarPro or similar. The tuner is in each program. However, not all of them can be customized to twelve-string guitars the guitar, but it does not matter. Put option for the six-string, and extra string with the key should be plotted in octave. You can use an online tuner designed specifically for 12-string guitar. Of course, you will need a sound reproducing apparatus. In this case, the speakers the headphones. The principle settings are the same for online tuners that built-in. To master it better, coming on a site designed for artists on the 12-string guitar. You will see a picture of the guitar socket. Click on it right mouse button. You will see a window where you will see several buttons that allow you to control the tuner. Below the written notes. Each of them corresponds to the sound of the strings on which it is drawn. Click on the corresponding picture. You will hear the sound of a certain height. You need to twist the pin until then, until the sound of the strings will not match this sound. If desired, the sound can be stopped using the Stop button or Stop Sound. Do the same with all the other strings. 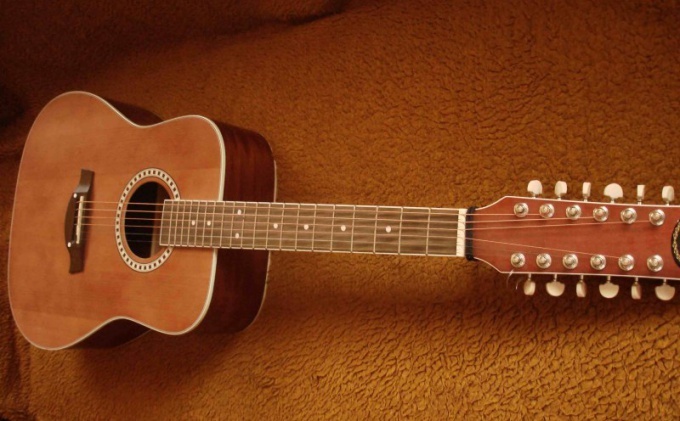 Online or built-in tuner usually gives a standard Stroy 12-string guitar. But some popular musicians are tuning the guitar differently. For example, there is setting option 12-chord as a 7-string guitar without the fifth string. There are other options – low or high the last string, for example. In all these cases, and when the tuner cannot tune dvenadtsatistrunnye, it is useful to apply a mixed method setting. Part of the strings you set up the tuner part in a standard way, that is clutching the strings on certain frets and adjusting them in unison to the previous one. The numbering of the strings of a guitar may be different. When using the tuner usually number 1 is the first additional 2 – first main, 3 – additional second, 4 – second base, etc. In mixed method, the different version numbering. The main strings are called in the same way as shestistrunniki, and the additional designated number of the main strings with a letter. Remember build six-string guitar the Mi-si-Sol-Re-La-Mi. Adjust the tuner for the main strings. Additional configure them in octaves, that is, holding the key at the 12 fret. The first string is built in unison with the main.